China announced in 2015 that it would shut down its domestic ivory market by the end of 2017. Authorities took their first step toward meeting the commitment given to President Obama by closing fifty-five retail outlets and twelve carving factories across the country. The remaining 105 concerns are scheduled to before December 31st. The Chinese government acknowledged it faces significant challenges in keeping this promise, but a minister of the Department of Forestry said China is a "responsible country and it takes its international obligations seriously", perhaps a veiled reference to Trump's vow to cancel the Paris climate accord to which China is also a party. One of the challenges is determining what to do with the raw ivory left over after carving operations are completely shut down. US Person recommends China burn it, as other ivory supplying African nations have courageously done. Another is finding work for the highly skilled artisans who now carve the substance. But only if ivory is treated as worthless in the marketplace will men learn not to covet it. A recent report by an elephant conservation society shows that the price of ivory tusks in China has dropped to $730/kg down from $2100/kg in 2014. What should be coveted by the Chinese is the 200-250 wild Asia elephants that remain alive in wild Yunnan Province, a tiny fraction of the wild elephants that populated China into the 17th century. 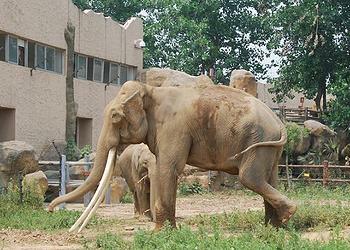 Most of China's elephants now live in zoos. [photo credit: Antoine49]. China's decision to close a profitable big business is being praised by CITIES leaders as giving hope to elephants and humans for their viable future on Earth.